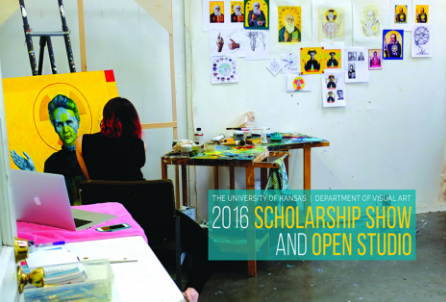 LAWRENCE – University of Kansas visual art students will show their work for the department’s annual scholarship exhibition starting Sunday, May 1, at Chalmers Hall. The exhibition is free and open to the public. The showcase will feature art from more than 60 undergraduates. Scholarships are based on the merits of their creative work and academic performance. Student work will be on display in the Art & Design Gallery from May 1-6 and in the gallery on the fourth floor of Chalmers from May 1-2. A range of disciplines will be represented, including ceramics, drawing, expanded media, jewelry/metalsmithing, painting, printmaking, sculpture and textiles/fibers. The exhibition begins with a reception from 2-4 p.m. May 1 on the third floor next to the gallery. During that time, the department will host an open house in all studio areas. Maps of the building will be available. The studios will be open to the public for May 1 only. Chalmers Hall is at the northeast corner of 15th Street and Naismith Drive. Visitor parking is available at the Allen Fieldhouse Parking Garage, 1501 Irving Hill Road. Accessible parking is adjacent to the building behind Marvin Hall.